"From a lower cost of ownership perspective, it actually makes more sense to protect your projector investment by choosing a 3LCD projector with dust filters." Located in a former coal-mining region near Pittsburgh, the Burgettstown Area School District faces the same perplexing issues as other districts across the country. How does it meet the No Child Left Behind act's accountability requirements and equip its 1,550 students with 21st century skills? Without the coal dust that once settled over its surrounding hills, Burgettstown knows that success in today's world depends on technology. Thanks to Pennsylvania's Classrooms for the Future state grant, Burgettstown is able to bring new programs, teacher development and technology to the district. The grant program's goal is to put a notebook computer on each desk, with projectors, interactive boards, cameras and scanners in every high school English, math, science and social studies classroom. The influx of new technology is timely as the Burgettstown district undergoes a major renaissance through the reconstruction of its middle school/high school. The small borough of Burgettstown, bordering West Virginia, has seen a big new gymnasium, 1,000-seat auditorium, and classrooms arise from the dust of its construction site. The renovated classrooms are equipped with teacher stations including laptops, carts, ceiling- mounted Epson 3LCD projectors, speakers and interactive boards. "The new equipment finally gives both our teachers and students a media-rich learning environment," said Chris Navadauskas, the district's technology director with a master's degree in instructional technology. "Since the everyday life of most students is already technology-driven, we find that our students learn best in a classroom that presents information in a familiar way." Navadauskas spends a lot of time thinking about the big picture of technology, but his job also focuses on the everyday details of installing and maintaining equipment, while coaching 115 teachers how to use it. "It's easy to get sidetracked by non-issues," he said. One such "non-issue" was whether or not the classrooms needed projectors without dust filters. "There is a myth that filterless projectors have lower maintenance needs that translate into lower operating costs," said Navadauskas. "But the simple routine of cleaning a dust filter is not a maintenance nightmare and does not bring extra costs." "From a lower cost of ownership perspective, it actually makes more sense to protect your projector investment by choosing a 3LCD projector with dust filters," he said. "Especially if your school is in the middle of a major construction project." Navadauskas decided to return the filterless DLP projectors, which were an option through the state grant. "Once I saw all the features of the Epson 3LCD projectors, I knew the projectors would be more beneficial to us," he said. Today, the Epson 3LCD PowerLite projectors are bringing more life and excitement to Burgettstown classrooms, which the district believes will translate into higher test scores. The everyday lesson is now presented in bright, vibrant images, with up to 2,200 lumens of color and white light output. 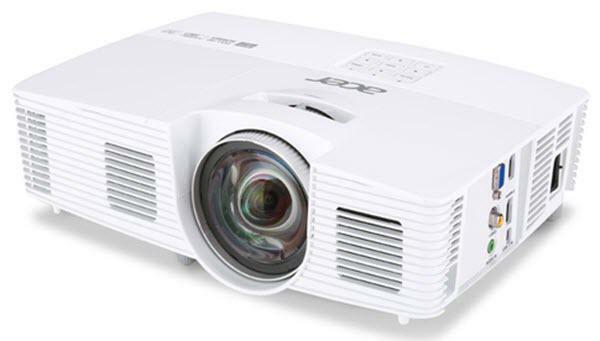 ** With 3LCD technology, the projectors display true-to-life color and detail without color breakup. Navadauskas also has the option to monitor and control the projectors over the school's network. The projectors also have built-in speakers and closed captioning functionality. "If we put this equipment in the classroom without showing teachers or students how to use it, it would just collect dust," said Navadauskas. Since the heart of the Classrooms for the Future grant program is teacher development, he spends much of his time educating teachers. "Our teachers want to learn what classroom technologies are available to help them create, customize and integrate content - whether it's text, images, lesson plans, tests, web, video or audio," he said. Teachers see the benefits of projectors in the classroom as they boost attention levels, improve understanding and help retain information. * Lamp life results will vary depending on mode selected, environmental conditions, and usage. Lamp brightness decreases over time. ** Light output varies depending on modes (color light output and white light output).